What does 422 stand for? What does 422 mean? This page is about the various possible meanings of the acronym, abbreviation, shorthand or slang term: 422. Year 422 (CDXXII) was a common year starting on Sunday (link will display the full calendar) of the Julian calendar. At the time, it was known as the Year of the Consulship of Honorius and Theodosius (or, less frequently, year 1175 Ab urbe condita). The denomination 422 for this year has been used since the early medieval period, when the Anno Domini calendar era became the prevalent method in Europe for naming years. 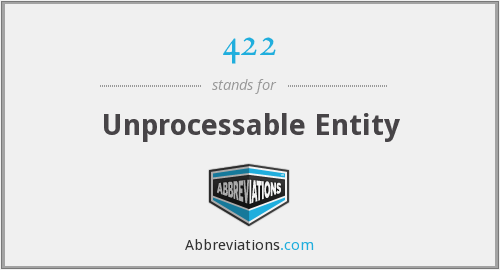 Couldn't find the full form or full meaning of 422? Know what is 422? Got another good explanation for 422? Don't keep it to yourself! "422." Abbreviations.com. STANDS4 LLC, 2019. Web. 25 Apr. 2019. <https://www.abbreviations.com/422>.